Congratulations to the 15 girls from the Willoughby Mosman Swans JV teams who were selected for the AFL Female Talent Pathway Academy program for 2019. The 2019 cohorts will train from November 2018 through to April 2019 and will then trial for their respective AFL NSW/ACT teams. Well done ladies!!! THE explosion of women and girls playing Australian football is benefiting sporting clubs at every level, but is putting pressure on facilities. Adelaide Footy League president John Kernahan said the growth in women’s footy at grassroots level “is enormous”. “We have enjoyed a 50 to 75 per cent growth year on year since 2015,” he said. Click here to read the full article published in The Herald Sun on Feb 2, 2018 by Craig Cook, The Advertiser. Prestigious Sydney private schools and rugby union traditionally go hand-in-hand. But a new sporting shift is underway. Independent girls schools have noticed an increase in AFL participation in male schools once dominated by rugby, and they are jumping on board. This month, the first ever AFL Sydney Independent School Girls competition will kick off. AFL NSW/ACT chief executive officer Sam Graham said the Sydney area has experienced extraordinary growth in female football. “In 2017, we saw a 78 per cent increase in female club football participation across New South Wales and the Australian Capital Territory, the fastest growing segment of our game,” Mr Graham said. “This growth has allowed us to provide Sydney’s independent girls schools with the opportunity to play football in an organised competition, something that has existed for their male counterparts since 2013. “It is great to have six independent girls schools taking part in the six-week competition, and it is a real credit to everyone involved in making this possible. 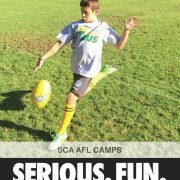 Conducted by our own Tim Barling – Head coach of U13, U14 and U17 Willoughby Mosman Swans and head coach of Riverview yr 9-10 teams.